At a depth of 20.0 km below the seabed, the shallow near-field quake struck 86 km northwest of the mining area of Iquique, hitting a region that has been rocked by numerous quakes over the past two weeks. According to the USGS, this earthquake occurred as the result of thrust faulting at shallow depths near the Chilean coast. The location and mechanism of the earthquake are consistent with slip on the primary plate boundary interface, or megathrust, between the Nazca and South America plates. In this area, the Nazca plate subducts eastward beneath the South America plate at a rate of 65 mm/yr. Subduction along the Peru-Chile Trench to the west of Chile has generated the uplift of the Andes mountain range. Ocean Networks Canada's seismometer in Cascadia Basin recorded the tremors as they crossed the North Pacific. Seismic data clearly indicate arrival of the initial P waves approximately 750 seconds (12.5 minutes) after the earthquake, and following S waves about 1375 seconds (23 minutes) after the earthquake struck. Bottom Pressure Recorders on the NEPTUNE Observatory also detected passage of the tsunami in real time, as it crosses our observing stations in the northeast Pacific. 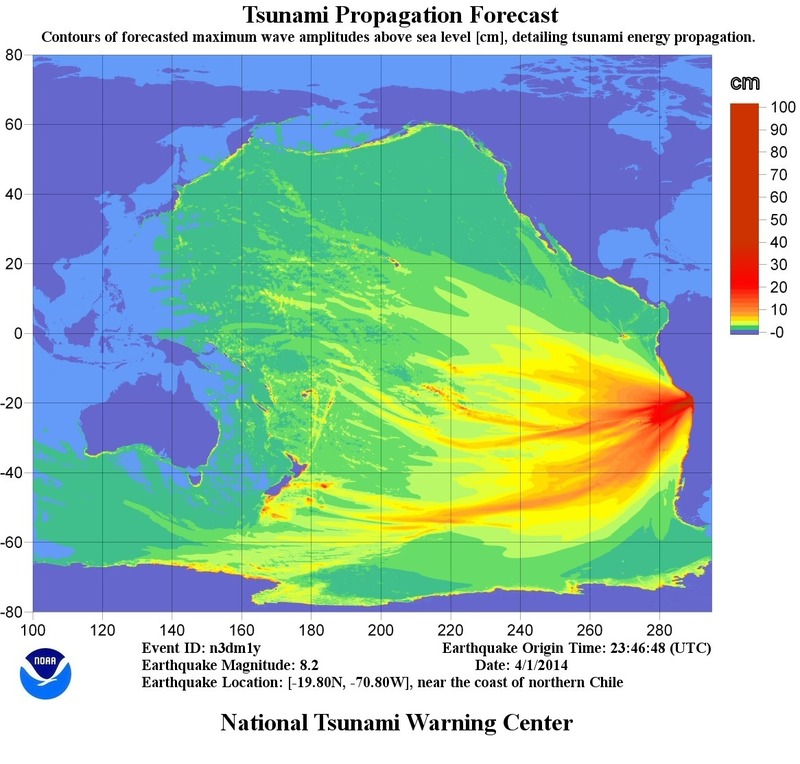 A 1.9-metre tsunami was recorded at a northern Chilean port Tuesday evening. The Pacific Tsunami Warning Center issued an alert for all of Latin America's Pacific coast. There was no threat issued to the Pacific coast along North America. NOAA issued a forecast of tsunami heights as the energy propagated away from the source region, indicating heights up to 100 cm close to the epicenter, with rays of 2-10 cm wave heights extending across portions of the South Pacific Ocean toward New Zealand and archipelegos in the South-Central Pacific. Tsunami wave energy propagation forecast issued by the Pacific Tsunami Warning Center, showing contours of maximum wave amplitudes (in cm) associated with the 1 April 2014 earthquake. Travel times for tsunami propagation were also modeled by the National Tsunami Warning Center, with expected arrival of a small (2-4 cm) tsunami in coastal British Columbia beginning 15 hours after the event, around 7:00 AM Pacific Daylight Time. Predicted travel times for tsunami waves generated by the 1 April 2014 earthquake. Three-hour intervals are marked by the heavy white lines, intermediary hours are marked by blue shades and dashed white lines indicate half-hour boundaries. Arrival in both New Zealand and British Columbia was predicted to begin approximately 15 hours after the initial earthquake. Seafloor pressure traces from the CORK pressure instrument at Cascadia Basin, 1-2 April 2014. The upper plot shows initial passage of the earthquake just past 00 UTC (indicated by the blue lines), followed by passage of the small tsunami beginning at 14 UTC. 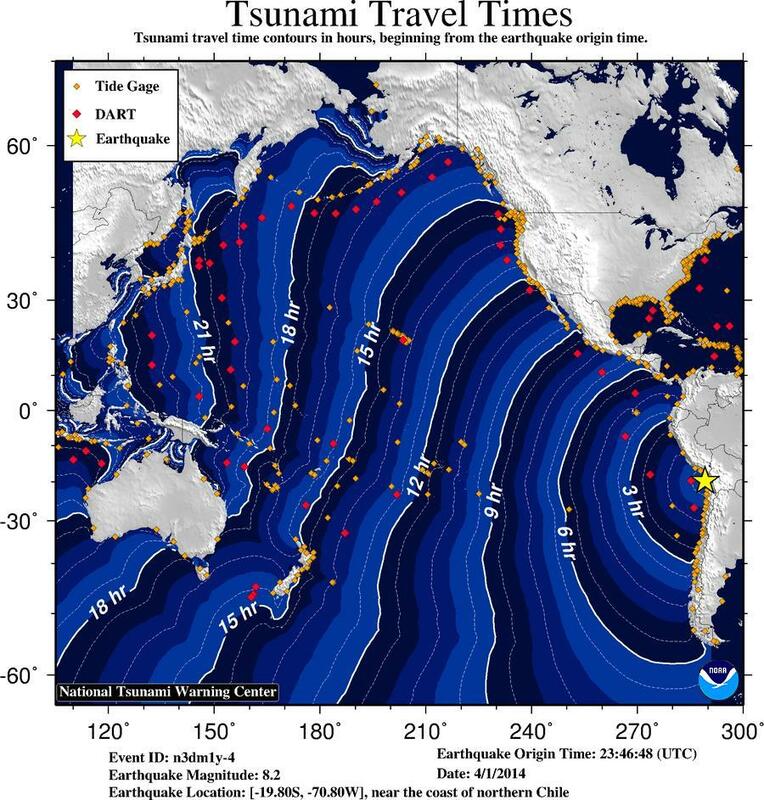 The lower plot focuses on the tsunami onset period, 11-15:20 UTC. Wave amplitudes at this deep-water site (2660 m) were approximately 8 mm. No stranger to seismic activity, Chile is one of the world¹s most earthquake-pronecountries. In 2010, a magnitude-8.8 quake and ensuing tsunami in central Chile killed more than 500 people and destroyed several hundred thousand homes along the coast.